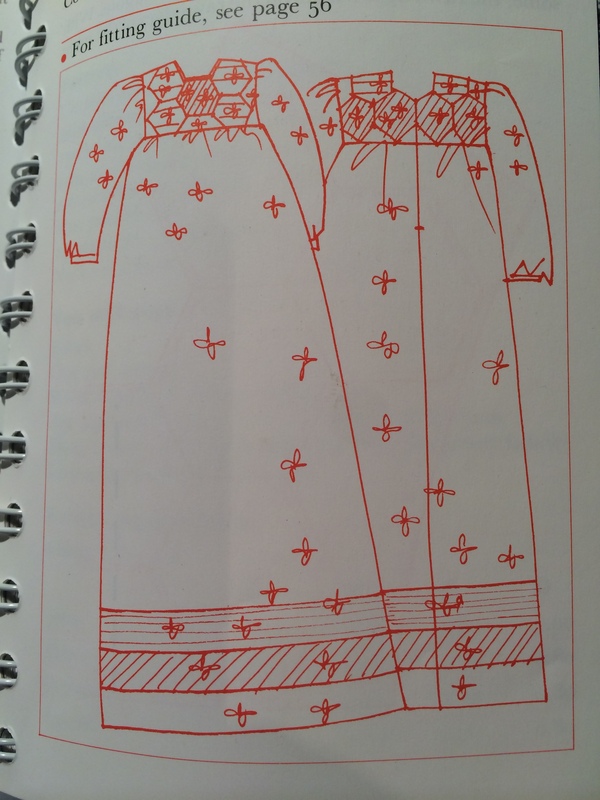 My project is to produce a contemporary Christening gown which, while traditional (as requested by parents), also avoids yards and yards of lace, pin-tucking, embroidery, and hand sewn French seams. A short history of the garment can be found here. The Ann Ladbury pattern I have chosen, interestingly offered a “modern” take in the 1970s – a patchwork version. This harked back to Victorian times when hexagonal patchwork was popular. Modern and traditional are not really polar opposites – everything gets re-invented and recycled over time especially in the world of clothes and fashion, doesn’t it? Here is the 1970s “modern” version. Personally I don’t really like the placement of the patches on the yoke, but I suppose if the fabrics were right this might work. The baby modelling the grament doesn’t look too impressed. So I approached the modern/traditional issue with a desire to bring some freshness to this garment. The silhouette, colour and fabric are what you would expect. But I decided against buying and applying layers of delicate lace, or driving myself mad with rows of tiny pin tucks. As the garment is for a modern boy, and quite a heavy one at that, I decided we could do without a flounce and lacy neckline. Instead I fancied using (ancient) printing techniques to create an impression of lace, embroidery or smocking. 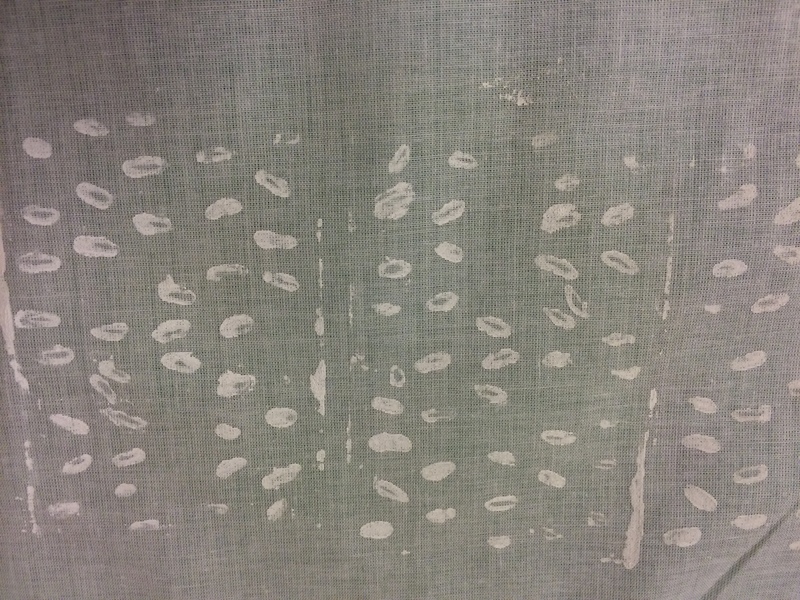 My idea was block printing some patterns, in white fabric paint, on to a slightly transparent white lawn cloth. I tried printing with lace but this wasn’t very satisfactory. I needed a bolder effect. 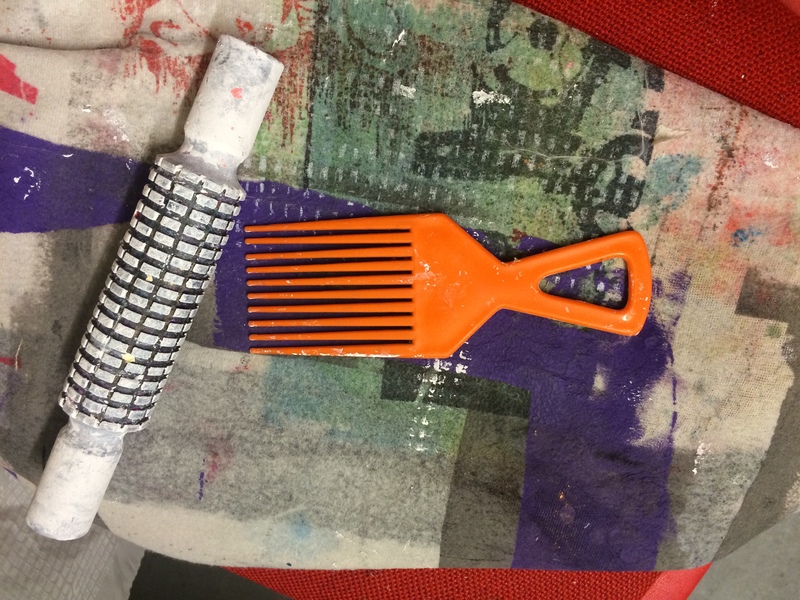 Here are the tools I used. 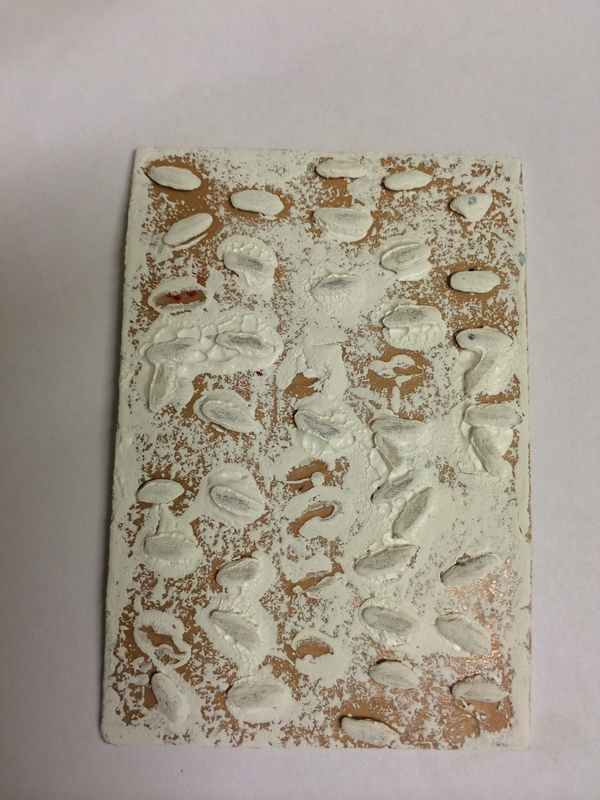 I also tried another technique, which involved sticking individual grains of rice on to a piece of cardboard and covering it with PVA glue to make it waterproof. Here it is at the end of the printing process, still covered in the white textile paint. 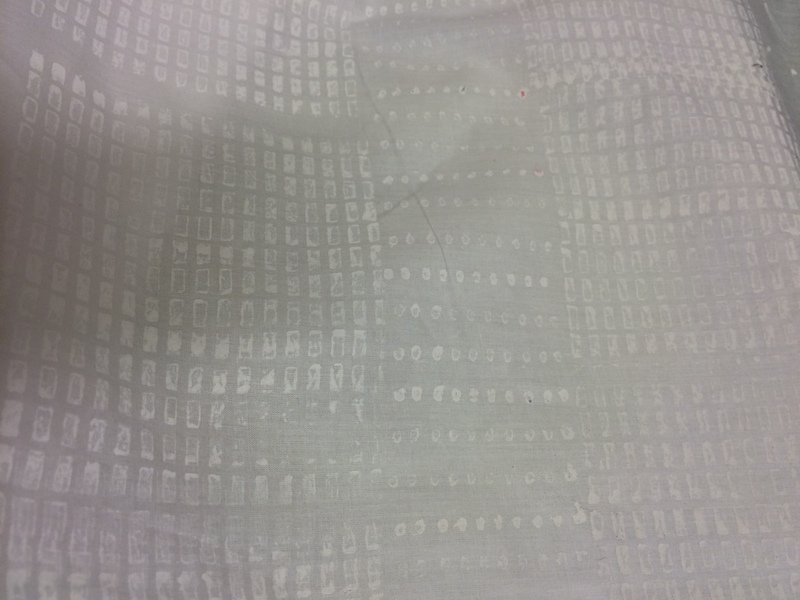 The cotton lawn was laid out on the blankes and I printed two boarders and a stripe across the middle. This look is created by using the roller, with the comb used in between. And here is the rice print, close up. Here is the work in progress. I have still to add sleeves, hems, button holes and press studs. The printed design is limited to the yoke, hem and sleeves. Wow what a clever idea to use rice for fabric print. 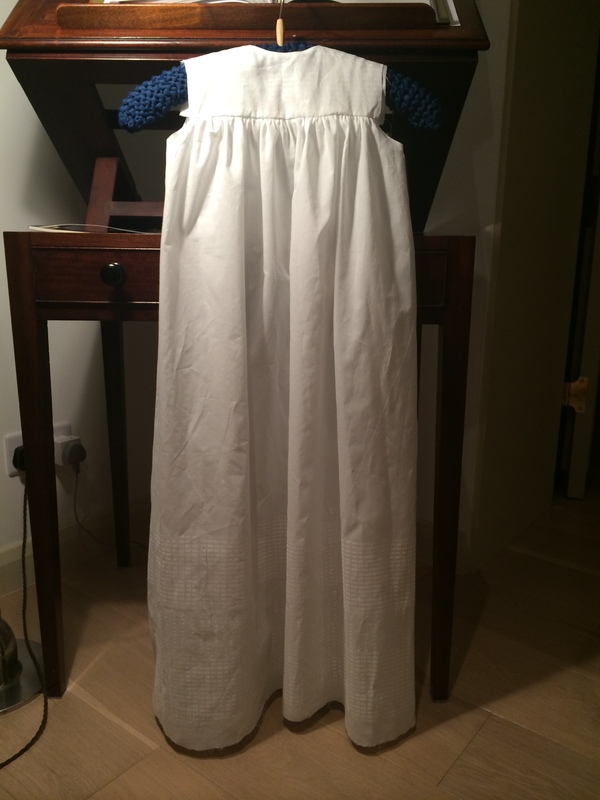 Love the christening gown and can’t wait to see the finished garment. I’m with linnyjcreations… this is a WOW project! I’ve always been interested in creating unique fabrics and you’ve certainly done that. I’ll be interested to see the final result. Lovely. It will be a treasure. Have to remember that rice trick. Thanks.